An improbable couple meets after high school graduation and must deal with their friends, family, and other pressures just to stay together. Finally, a fanedit you don't have to force your wife or girlfriend to watch. To add in the deleted and extended scenes to one of my favorite movies. In doing that, some of the character arcs feel more rounded out. Like a lot of deleted scenes, these aren’t the greatest quality. Nothing terrible but they’re noticeable. njvc for being an awesome musician. At first I contemplated doing a kitchen sink Extended Edition, adding every deleted or extended scene and using alternate takes. In the end I chickened out on the alternate takes (there is 1 alternate scene) as I couldn’t cut some of the iconic moments. The audio for the deleted scenes are in 2.0 and some of the sound mixing a little rough. In some of the scenes I added some 5.1 ambience/music tracks but not all of them. Lloyd in the rain on the phone with Constance. Replaced it with the version in the Alternate Scenes. Montage of Love Clips – I only added the scenes of Lloyd and the elderly. I didn’t add the kissing in the rain extended take. Sims Questions Court At The Home – Only the second half was added. Mike in Toilet – I cut the end of this. What I liked: Seeing the movie with all of the extra footage. What I didn't: A lot of the scenes put back in were jarring. Especially the speech in the beginning because the original had an echo and the added in footage didn't. I would have liked to seen a little more attempt to blend in the new footage. Overall: I think the editor did what he wanted to do and that is great. I didn't feel the movie better in this way than the original and actually makes the movie drag a little bit. Watching this really made me appreciate the original cuts. Extra: Keep up the good work. I don't want you to feel I was bashing you, rather the way you had added back the scenes was really well done, just felt the movie was better without them, which I know wasn't the point of your edit. 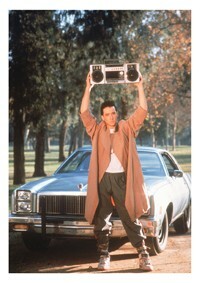 Say Anything is one of my all-time favorites from the 80's. I really enjoyed this edit, but not for any of the usual reasons. I was very interested in seeing the additional scenes and I can very well see why they were excised by the original editors. The theatrical version was well balanced and the cuts were well thought out. This edit really makes me appreciate the film editors craft. I really wish Neglify would have used the alternate scenes that he didn't have the nerve to use, just to see a greater contrast with the theatrical version. The editing itself seemed well done, given the source material. Obviously, the deleted scenes were noticeable for their lack of audio and video quality, but Neglify did extremely well in making it as seamless as possible. I do not intend this review as any sort of slam on the fan editor. On the contrary, I appreciate what he did. It gives me a greater understanding of this 80's classic and the art of film editing. This is a charming movie that gets its charm upgraded by the addition of multiple deleted scenes. The added footage is notably different in visual quality (lighting, graininess) but tonally fits the rest of the film by allowing you to see better where the characters are in their emotional journey. Fine performances by all the cast and very little cliche make this romance more than a mere teen romcom, and Neg's version fleshes out the characters to make a likable movie even moar likabler.